Editor: Gordon Nicotine-Sands, our 2016 Harvest Festival Pow-Wow Emcee, provides some information below on the origins of a pow-wow and its significance to First Nations peoples and some information on each of the dances that you’ll witness. You can find event details at the bottom of the post Key points to know . The Pow-wow was originally a ceremony (amongst dozens that were designed to give thanks to Creator and the spirits for the many blessings found in everyday life) typically found in the western plains of North America by many of the First Nations who inhabited the area. It is from these ancient practices that the modern day “Pow-wow” derives from, and has made its way to all points in North America. Today, the Pow-wow is a drug/alcohol free celebration of “life” through the expression of song and dance, where all are welcomed. The event is led and given direction by an Emcee, and an “Arena director”, who watches over the dance arena. At a “Pow-wow” the use of Eagle Feathers (and other items from the eagle) is quite prevalent. First Nations people have governmental exemption (within reason) when it comes to the ownership of eagle feathers. In many Native Creation stories the “eagle” is represented as a messenger from the spirit world, and is also seen as a protector. It is considered an honour by most First Nations to adorn eagle feathers on their outfits, which are given in different ways by a competent individual depending on the territory. For the most part the recipient immediately attempts to take on the responsibility of dedicating their life to teachings set out by their own nation. The Drum is an integral instrument for any gathering as singers use it to provide music for the event, for mainly the “dancers”, but also for everyone’s enjoyment. The Drum is sacred and considered to be the “heartbeat” of Mother Earth, and in combination with prayer and medicines it is said that the drum beat can be heard on the “other” side. First Nations Men, Women, and Children showcase dance outfits referred to as “regalia”, and dance to various songs. These practices are spiritual-based and are meant to invoke a “spirituality” for everyone in attendance. Many First Nations people believe that these experiences are healthy for your mind/body/and spirit. Good feelings, positivism, and adrenaline are what people typically feel at a “Pow-wow”. Although not a religious event per se (many Native ceremonies are held in First Nation territories and not for public view), several components of the singing and the dancing are considered to be not “man-made” but given to the people by a higher power. It is this belief system that many participants hold true, and keeps them respectful and humble. Through modernization, many Nations throughout North America have contributed several dance and singing styles through sharing and gift-giving. Many dances and song styles also originated in “societies” within First Nations where members were selected for admission based on fulfilling obligations and/or sacrifices. Many of these ‘societies’ still exist several hundred years after their creation. In addition to the singing and dancing, you will also find many authentic Native craft and food stands, friends and families laughing and sharing, and occasionally visiting dignitaries from the local community. Visitors are invited and encouraged to participate at different times in the program where some songs are designated for ALL people, not just First Nations. A word on modern day dance styles: Although originally inspired by materials found in nature, some First Nations people have opted to replace many of the natural materials that have been used in outfit creation many years ago with a more durable selection of materials that stand up to the elements along with wear and tear. So it is not unusual to see materials such as yarn, ribbon, leather, or metal works, for example, all of which can be found at fabric and hardware stores, etc. It is the way that Native people fashion these items to their outfits that make them uniquely “First Nations”. 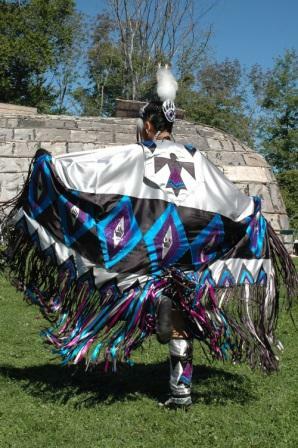 All men dancers use Breach-cloth type bottoms, bells, bead-work, and head pieces called a “roach” which are made from porcupine and deer tail hair. The Men’s Traditional dance is a “warrior’s” dance that originated from the western plains. The dancers are distinguished by a circular item on the back known as a “bustle’ which is constructed of Eagle Feathers and other materials. The dancer tells the story of the warrior who may be on the hunt, or on the warpath. During this dance you will see the dancer crouching, looking off into the distance, looking at the ground, and forward bursts. The dancer’s regalia is adorned with items needed for not only battle but also for healing. Although some dancers stay true to ‘tribal’ colours and designs, the outfit is designed to the dancer’s preference. The dance style is accompanied by a slower-to-medium fast drum beat. The Men’s Grass Dance is a dance that originated in the western plains where the landscape is void of trees and abundant with long grass. There are several origin stories on the dance with some tribes having warrior societies. Some believe that dancers cleared an area of an impending ceremony of all the grass. Others believe that it is a dance of acknowledgement to the power of items in nature such as the sweet-grass, used in nearly ALL native ceremonies. The dancers have long flowing yarn and ribbon on their outfits to mimic that long flowing grass blowing in the wind. It is accompanied by stepping and swaying. The dance style is accompanied by a medium-fast drum beat. The Men’s Fancy Bustle Dance is another type of warriors’ dance used by young men and boys, and originated in the southern United States. The dance style is categorized by two “bustles” constructed of white turkey feathers and brightly coloured “hackle” feathers, which are worn at the base of the neck and back. It is an opportunity for young men and boys to showcase just how acrobatic, fast, and athletic they can be, which usually gets the crowds cheering. The dance is of course accompanied by a fast drum beat. The Women’s Traditional Dance is a dance of honour, respect and inspiration. In many First Nation teachings, women are held in the highest regard. First, and foremost, for being givers of life, but also for other qualities and contributions that bind families and communities together, such as wisdom, strength, and pride. There are several “medicines” such as tobacco, sage, sweet-grass, etc. carried by the dancer. The dance is very stoic, with minimal movement. Typically there is detailed and high quality bead, fabric, ribbon and feather work put into the outfit. The dance is accompanied by a slower to medium-fast drum beat. The Women’s Jingle Dress Dance originated from the Great Ojibway Nation of Northern Ontario and Minnesota, this special dance is considered to be “healing” in nature. It is believed to be given to the people from the sky-world, as a ceremony to help those who are in need of spiritual lifting. 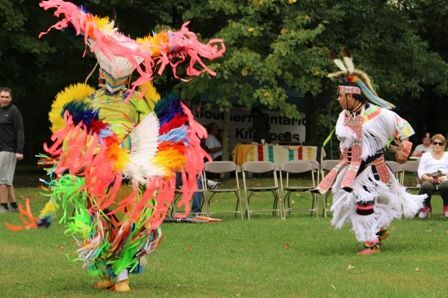 From its creation to modern day, dancers are still called upon whenever there is a member of the Pow-wow circle or community who are in need of spiritual help due to tragic and unfortunate circumstances. Young women who decide to take up the jingle dress dance are handed down protocol and teachings by senior dancers, explaining their roles and responsibilities when wearing the dress. The dress is also unique in its creation in that metal cones are fixed to the dress to create a “shook” type of sound which is said to be heard on the “other” side, just like the “drum”. The Women’s Fancy Shawl Dance is relatively modern, and is a way for women to showcase how athletic, fast and light footed they can be. It has been nicknamed the ‘butterfly’ dance because of the wide and colourful shawl worn by the dancer. Emphasis is also put on the outfit design, with plenty of detailed, colourful and eye-catching patterns used in the ribbon and material work. It is unique in the way that it is the only dance style that doesn’t employ noisemakers, such as bells or jingles. Editor: Our thanks to Gordon for his contribution to the blog and for providing such great information. For the event details and to stay current right up to your visit, head on over to our Pow-Wow site and bookmark it for future reference. You could always sign up to our e-newsletter and stay abreast of all the museum’s activities. Plans are underway for our 9th Annual Harvest Festival and Pow-Wow taking place September 17 & 18, 2016. The event runs from 10:00 a.m. to 4:30 p.m. both days. Admission by donation. Free offsite parking with shuttle service. Accessible Parking available on-site only.